The Nomads time trial squad compete in several competitions during the season. We enter teams in to open events around the region and also compete against CC Ashwell, Beds Road CC and Icknield RC in the regional Interclub series. The club’s full 2014 time trial calendar will be published in early January. We aim to promote around 40 time trials in 2014. The course details are available from our courses page along with the relevant GPS files and links. Current club records are also available for viewing. The Tuesday night 10s and 25s which run through April to August are based around Southill, Beds and begin in April. We have other events occurring in March and our full programme runs through to December. 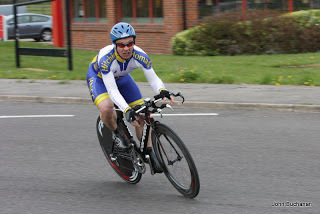 2013 Club Captain, Simon Doyle competing in an open event.